Welcome to another great SMX West 2011 session. This session looks at popular search apps on different devices, how they gather data and the opportunities they offer to marketers. I’ve shoved some almonds in my mouth to try and counteract the massive amount of coffee I drank in the keynote with Danny Sullivan, so I’m all set and ready to go. Danielle Nohe, Danielle Nohe, Director, Technology & Entertainment, Compete, Inc.
Anil Panguluri, Director, Yahoo! Mobile Search and Discovery, Yahoo! First up is a Solution Spotlight presentation from Rich Skrenta of Blekko – go Blekko! Blekko just released its mobile app, check it out for the iPhone. Greg Sterling says this is a cousin to the location services session yesterday. First speaker is Danielle Nohe. Compete monitors a lot of online traffic. We are going to look at that data. We are looking at operating systems. 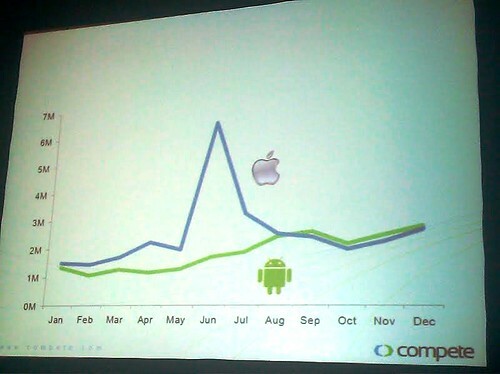 The slide compares growth for iPhone versus Android. Thirty-eight percent of cell phone users are looking to upgrade to Smartphones. She is sharing data from the Smartphone Intelligence survey they conduct. The data is showing that 29 percent use mobile to look up local stores monthly; making dinner reservations 12 percent daily. What’s a must-have for people buying Smartphones? Thirty-eight percent said an integrated apps store is a must-have. Consumers are becoming very selective on what they choose to download though. Eighty percent of the people that downloaded apps in the survey data said the apps were free. Most applications downloaded are to solve problems like what restaurant to go to or what store to visit. Twenty-eight percent of users have used a barcode scanner. She is talking about the seamless transition of the act of scanning a barcode to buying the product online via your mobile [think about the implications of that]. Mobile advertising: In the survey data, 38 percent of the people exposed to mobile advertising took some sort of action following the advertisement. Next is Anil Panguluri. He is going to talk about browser-based versus Web-based behavior. 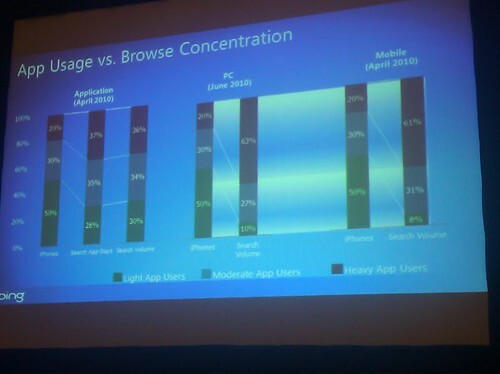 Users are using browsers and apps almost at the same rate. Thirty-six percent using browser versus 34 percent using apps in the United States. It’s a choice they are making based on what they need/want. Seventy-six percent of people search from PCs and 61 percent on mobile Internet browser. Given a choice, people prefer apps. But, still use browser in large volumes. That’s the takeaway, he says. Data shows three in 10 are motivated to use search engines because it fills an immediate need. Many apps give people information much quicker than a browser can. Certain things are better in apps. More app users try a search engine as part of mobile shopping. Prediction: Mobile search will go deeper in the user flow. Won’t just give info but will tell you what to do with it. Select the ad format that keeps the user in context. Survey data shows that users prefer ads that don’t take them away from what they are doing. Mobile ads are more impactful than online display ads. Mobile ads do anywhere from two to five times better. He is now talking branded apps. These are apps that provide value-add information. His data shows many people discover branded apps from television commercials. They see a commercial and then search the apps store for apps of the brand. What kind of engagement is branded apps receiving? His data shows mostly less than 1 percent across many big-name brands. Kleenex was a little more than 1 percent. Location and time for relevancy. Fifty-three percent of queries have local intent, according to his research. Top categories are movies and restaurants. It spikes as the weekend nears and occurs. Checking-in becoming ubiquitous. Task completion. Showing it takes an average of 21 steps to choose a local restaurant. There are one and a half more typos in mobile than in PC searches. Seventy percent of task completions occur in one hour. Saving money. Fifty percent of consumers are interested in redeeming coupons; 5.3 percent of users redeemed mobile coupons. Around 56 percent of iPhone users compare prices. Almost 40 percent of merchants looking to launch mobile coupons in the next 12 months. In one year of data, it’s showing that the top categories for apps were communications, weather, navigation and maps, streaming videos, social networking and music among others. Mobile browser experience and app experiences are becoming very similar. From an investment standpoint, they are continuing to invest in both. Visual aspect is important to the mobile products. Make sure it’s visually organized, task oriented and local. Angie Schottmuller is next. Switching gears, she is talking QR codes. What are mobile tags? An advanced 2D barcode image. It gives users additional information about something or facilitates something. QR code is one of the more popular. Mobile barcode scanning is up at much as 1,600 percent. There’s a lot of mystery that is involved, so it’s important to include information in it, if you’re using it in marketing. What can 2D tags do? Two tools you need: Ability to create a barcode (search for 2D code generator) and barcode scanner (mobile app like 2D code reader). Many of the big brands are using codes but it’s not just them. Bands are using it, customer support is using it, local libraries can use them and so on. Some brands are printing them on print coupons. Like General Mills, giving ideas for recipes with that product. Zoo Records did a “hidden sounds” campaign where they promoted rock bands with different QR codes that contained interviews and music and such. They put them into animal shapes around the city and users could scan it and get more information. Start with a business objective and key metric. What are you looking to improve? Conversions? Traffic? Add value to the customer. Don’t just take them to a Web page with the same information they can find elsewhere. Select a 2D type accordingly. Things that matter are code and data size, ease of scanning, surface placement, to name a few. Confirm adequate WiFi. In the stores you are featuring them in, make sure it’s set up well. Be visually creative with codes. This allows for creativity and flexibility, shows you’re tech-savvy. Check out the New York Times anniversary QR code for an idea. But at some point, you have to know when to say when. It still needs to look like a tag or users won’t scan. Track your analytics. Code-generator analytics include ScanLife, Microsoft Tag, BQRious. Place codes in scan-able locations. Billboards on freeways maybe not the best idea. Plastic display holders may reflect and make the barcode hard to scan. Look at the display of it to see if a shadow will be cast on it accidentally. This can also interfere. Provide adequate time for people to scan. Ensure proper code size. QR codes should be 1 inch by 1 inch. Fortune cookies are too small for QR codes. Tell users what happens upon scanning, so they’re not confused. Provide a backup or alternative to those who don’t have Smartphones. Test your codes – Test! Test! Test! Q: Are there any best practices to get reviews for apps? A: Danielle says she’s not sure but apps are a lot of word of mouth. She thinks an app recommendation tool would be helpful. A: Angie says before you promote your app, have a test group use and review it. Those reviews will show other people are using it. Stay tuned for more SMX West 2011 coverage after the lunch break! Thanks Jessica, for writing about the session.